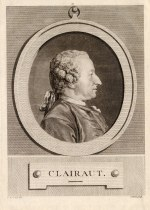 I should have told you that last summer Mr Clairaut read a Memoire in the Academy on refraction [C. 23]; and to take off the french prejudices against sir Isaac Newton's attractive forces, he explained the action of bodies on ye rays of light, by conceiving them as surrounded with an atmosphere impelling these rays towards the bodies: as the cartesians suppose heavy bodies to be impelled to the Earth etc. It is indeed a very ingenious paper. Mr Clairaut is come much into the gout of mixed mathematicks, and of applying geometry to natural philosophy (RS, LBC 26, pp. 406-407) (Transcription C. Waff) (Irène Passeron, CP, 16 octobre 2009). La lettre de Martine est lue à la Royal Society le (26) 15 novembre 1739. Courcelle (Olivier), « 10 novembre 1739 (1) : George Martine (Paris) écrit à Mortimer », Chronologie de la vie de Clairaut (1713-1765) [En ligne], http://www.clairaut.com/n10novembre1739po1pf.html [Notice publiée le 8 février 2012].